Foliage: Tardily Deciduous. Resembles Red Oak, but smaller. New growth is Red. Comments: Often planted as an evergreen, Canby's Oak has semi-evergreen qualities, but it is tardily deciduous. From northern Mexico. Highly tolerant of heat, drought, alkaline soils and pests. Makes wonderful shade for small yards. Can be planted as a specimen. Fast Growth. Resistant to Oak Wilt. Commonly planted in South Texas including metropolitan areas such as Houston. Great potential within north Texas! 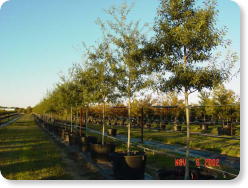 An underutilized, highly adaptable shade tree that will tolerate urban planting conditions.